The first baby born in the NHS now fighting to save the NHS! June Catterall has worked in the Health Service all her life. At Stepping Hill and Hyde Hospitals, and at Withington psychiatric hospital. ‘I was also mobile warden for Social Services in Gorton for nine years. I used to work far more than I should have. If some one needed help I was always there. Over the years it got more difficult. The cuts made it harder. I got upset over the cuts,’ she said. ‘I used to do three shifts and look after three kids. It takes its toll. In the end the stress got to me and I had a breakdown.’ June became a patient. ‘I got fantastic treatment,’ she said. 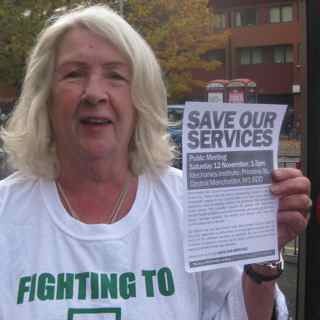 June was out on the street last week campaigning outside the MRI hospital in Manchester, petitioning to save the psychiatric unit Edale House, which is now threatened with closure. Edale House is a purpose built psychiatric unit built under using the PFI financial scheme. Now the Trust says it is too expensive and must be shut. Patients who live in the central Manchester area would in future have to travel to North Manchester or to Wythenshawe in the south to receive treatment. It would be much more difficult for family and friends to visit. ‘Its just a cost cutting exercise,’ explained Pat Wheeldon,’ who is the founder member of the focus group which supports carers and patients. ‘We have 70 members in our group.’ she said. Patients with mental health conditions who need treatment, care and support, are being squeezed from both sides by the cuts. As well as health cuts, social services are also being cut. ‘Outreach teams are going in January,’ explained Pat, who is a carer for her son who has a dual diagnosis. People were queuing to sign petitions and lend support on the campaign stall outside Manchester’s largest hospital MRI. Health campaigners will be joining with those fighting the savage cuts to adult social care made by Manchester City Council next week. Some are travelling to London for the Unite the Resistance Conference.